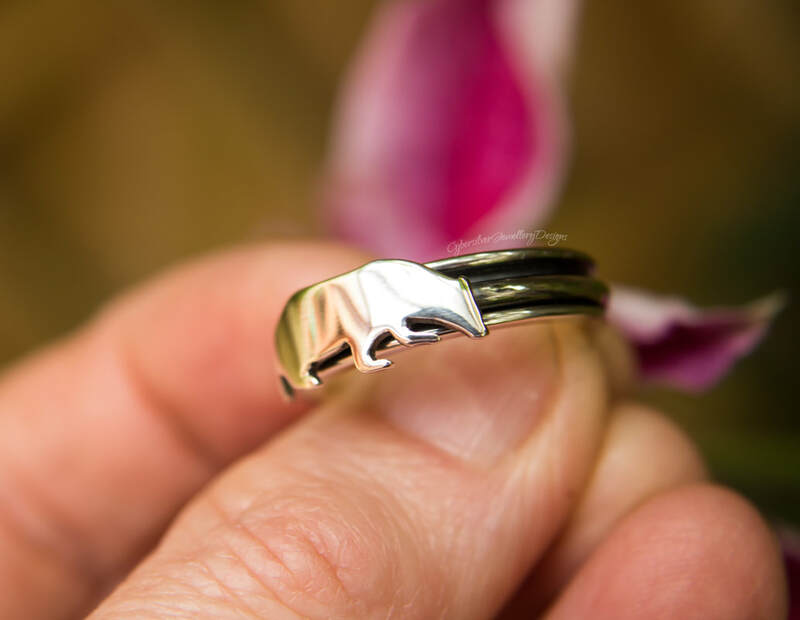 A snuffling badger silver spinner ring - gorgeously chunky and entirely hand fabricated by me to my unique and original design. Each ring is created from thick sterling silver and features a snuffling bader, each one lovingly hand cut and unique. These rings are essentially two rings in one - the badger ring spins all the way around a separate inner ring. The silver has been lightly oxidised, polished and then waxed with a microcrystalline wax to help protect the oxidised surface. Oxidisation is a surface treatment which can continue to lighten with wear. This is really striking ring - part of my woodland series. Your ring will come gift boxed - perfect for giving. Please note that these rings are individually handmade to order so there are slight variations in each one, making your ring unique. Please allow up to 20 working days for completion of your ring. Also available in spring hare and soaring dragon version. Delivery - To ensure you receive your ring promptly and safely, I post UK Special Delivery or International Tracked and Signed. These are tracked, insured and signed-for services. Royal Mail will only insure silver jewellery using these delivery methods.